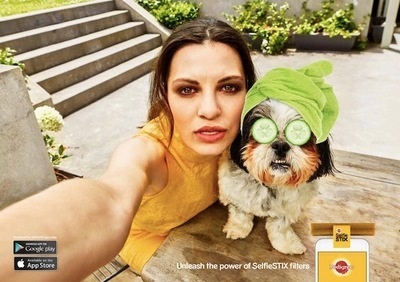 Entries from Digital Intelligence tagged with "new zealand"
In New Zealand, Pedigree launched a campaign to promote its new SelfieSTIX product which helps dog owners to create perfect selfies with their pets, winning a raft of Cannes Lions mobile awards in the process. 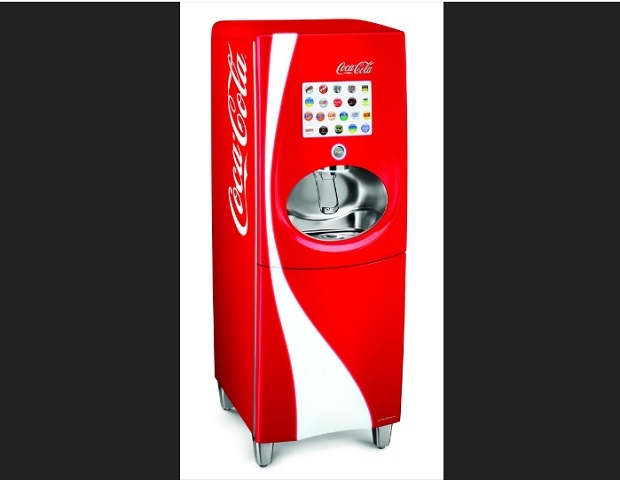 Coca-Cola is using artificial intelligence in a new vending machine popping up in universities across the US, Australia and New Zealand. Domino's has begun testing New Zealand pizza delivery via the first commercial drone delivery service in the world. The world’s premier rugby event would see New Zealand beat England in the final if the competition was based on social media audiences, according to programmatic and social sharing experts, RadiumOne. Most flight safety videos can be tedious affairs, but this new video from Air New Zealand transports us to Middle Earth, with a host of stars from the new Hobbit movies adding new meaning to ‘elf and safety’. 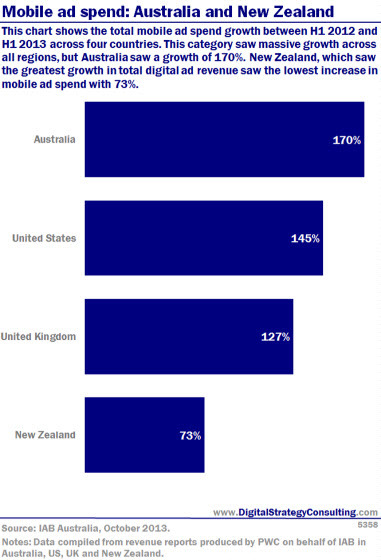 New Zealand social trends: What brands are succeeding on Facebook? Social media usage is now standard practice in our daily lives with 80% of online New Zealanders using these sites each month, according to new research from Nielsen. Instagram has released its new "one tap picture messaging app" Bolt, but currently only users in New Zealand, Singapore and South Africa can use it. The launch of the Snapchat-style app follows last week's accidental reveal of Bolt's existence when ads for it briefly appeared on Instagram. New Zealanders have well and truly embraced internet shopping. There are now 1.9 million New Zealanders shopping online, 56 percent of the total population, according to new research. This chart shows the total video ad spend growth between H1 2012 and H1 2013 across four countries. The US saw an increase in digital video ad revenue of 85%, exceeding its closest New Zealand by 33%. 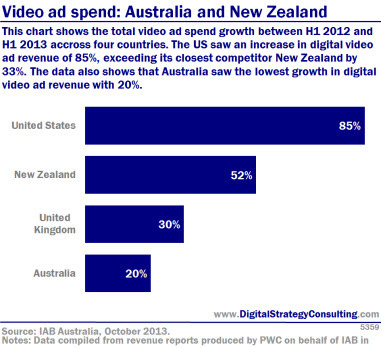 the data also shows that Australia saw the lowest growth in digital video ad revenue with 20%. This chart shows the total digital ad spend growth between H1 and H2 across four countries. New Zealand showed the greatest increase for the period growing its digital advertising revenue by 29%. Adversely Australia saw the lowest growth in ad revenue with 16%. This chart shows the total mobile ad spend growth between H1 2012 and H1 2013 across four countries. This category saw massive growth across all regions, but Australia saw a growth of 170%. 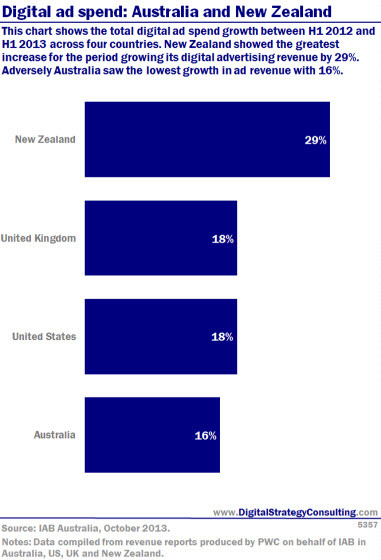 New Zealand, which saw the greatest growth in total digital ad revenue saw the lowest increase in mobile ad spend with 73%.